A massive Martian dust storm is seriously affecting operations of the agency’s Opportunity rover, which has been operating on the Martian surface for over 14 years. Scientists are now learning from various Mars missions currently operating to study this unprecedented event. 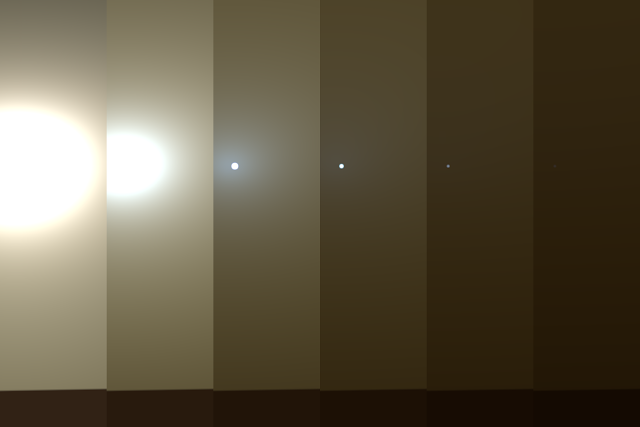 Animation: This series of images shows simulated views of a darkening Martian sky blotting out the Sun from NASA’s Opportunity rover’s point of view, with the right side simulating Opportunity’s current view in the global dust storm (June 2018). The storm is one of the most intense ever observed on the Red Planet. As of June 10, it covered more than 15.8 million square miles (41 million square kilometers)—about the area of North America and Russia combined. It has blocked out so much sunlight, it has effectively turned day into night for Opportunity, which is located near the center of the storm, inside Mars' Perseverance Valley.